I discovered the amazing combination of sour cherries and dark chocolate after trying Green & Black’s organic cherry chocolate. Cherry chocolate is not something I would have normally chosen as I used to associate preserved cherries with the fluorescent glacé ones that went into christmas cakes. Luckily the sour cherries in Green & Black’s are nothing of the sort, they’re a dark crimson colour and have a wonderful tart flavour (for a raw version of this sour cherry chocolate click here). Recently I was excited to find some dried cherries in our local whole foods store and I immediately thought I have to make something with these! To me, the other ingredient that sings out to be combined with sour cherries and dark chocolate is moist coconut, aka a Cherry Ripe bars! So I thought it would be fun to make a healthy version of the classic Cadbury “Cherry Ripe” bar, that’s dairy, refined sugar, preservative and additive free. I found two great dried cherry options, ROAR organic dried sour cherries and Ceres organics apple sweetened dried cherries. For the recipe below I went with the ROAR version as they were super sour and I liked the contrast, but either would work well. After a couple of recipe attempts which resulted in not enough chocolate, too much chocolate, too wet filling, wrong colour filling… too much taste testing… I finally came up with the winning combination! 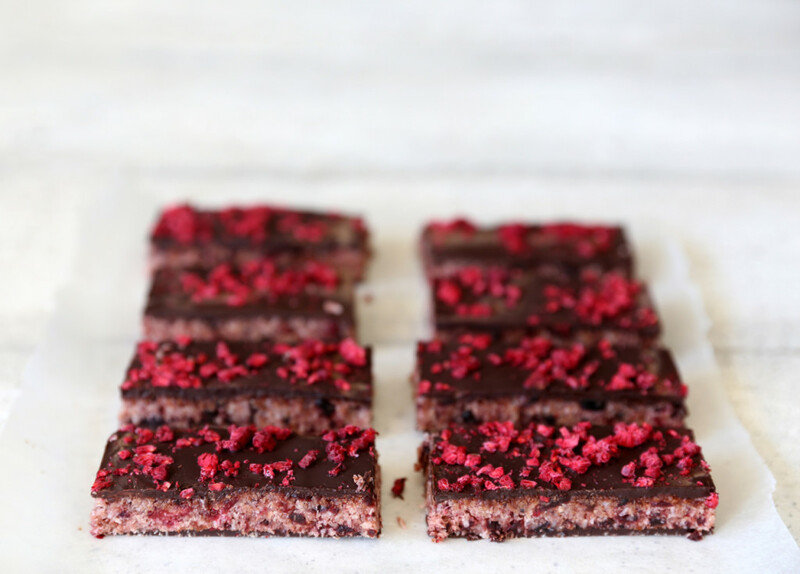 The best thing about these “Cherry Ripe” bars is they contain no gluten, dairy, refined sugar, additives or preservatives, and while they are definitely less sweet that the original, I think they taste much better! If you can’t find sour cherries in your local food store, simply substitute in more dried cranberries and vice versa. These homemade cherry ripe bars will keep well in the fridge for a couple of weeks and freeze well. Enjoy! Line a small tin (I used 18cm x 30cm) with baking paper. Melt the dark chocolate by placing it in a heat proof bowl set over a pan of boiling water. Ensure the bowl doesn’t touch the water to avoid overheating the chocolate. If using really dried cherries such as ROAR, start by soaking them in warm water for 10 minutes or so until they plump up. Then pour off the water and drain well. Place all the remaining ingredients including the cherries in a food processor and blend until well combined. The mixture should be slightly sticky and hold together when pressed. If too wet, add a little more dried coconut. Spread half the melted chocolate over the bottom of the lined tin and place in the fridge or freezer to set – approximately 5-10 minutes. Once the chocolate is just firm to touch remove from the fridge and spread the cherry mixture over evenly. Press down well. Pour the remaining chocolate on top and spread evenly with a spoon or palate knife. Sprinkle over crushed freeze dried raspberries to decorate and return the slice to the fridge to set, approximately 10-20 minutes. When the chocolate is firm, remove from the fridge and slice into bars using a hot, dry knife. I’m not sure the storage instructuons are necessary! There would not be any left to store !! Absolutly amazing … Would make great xmas gift.. Yum!!! I never ate a cherry ripe again after reading the label. I could eat a whole tray of these!!! Agreed!! I bought one to compare for this and didn’t realise how many milk products were in the cherry coconut layer! Yes from New Zealand, but spent a good while living in the UK. Isn’t it funny how New Zealander’s like to travel! If I wasn’t doing this I think The Urban Mum’s life sounds pretty fabulous!